The band was formed in the summer of 2002 by Blue Jensen, the band's current guitarist and vocalist. He was sick of the "weak" bands in his area, and wanted to find dedicated musicians capable of creating some brutal death metal. He recruited Mike Fitzgerald on drums and Michael Tocci on bass. With this lineup, a 2-track demo was recorded, which was quite well received. Around a year later, a 4-track MCD was recorded, entitled Artistic Creation With Cranial Stumps. 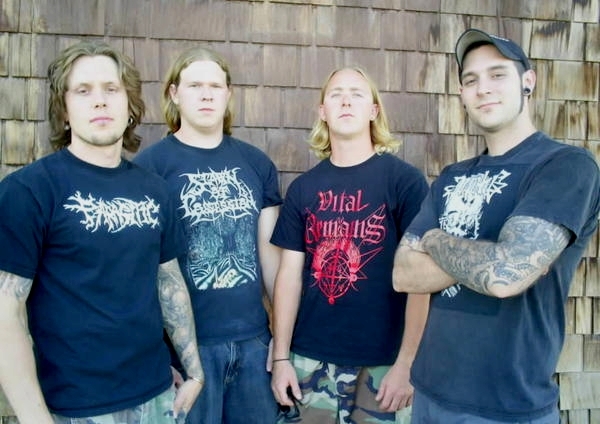 This MCD was then released under Unmatched Brutality, who signed Guttural Secrete to a two-album deal. Shortly after the release of this, Michael Tocci departed from the band, leaving the band as a two-piece for over a year (simply one guitarist and a drummer). Eventually, they met up with guitarist Randy Thompson, then the guitarist of local band From The Grave. Randy gladly accepted the second guitarist position, thus making the band a three-piece now with two guitarists (an almost necessity for their style of music). This lineup continued to play gigs and progress. As of 2006, Guttural Secrete's follow-up to ACWCS, Reek of Pubescent Despoilment was released under Unmatched Brutality.